L'Étape in Lac-Jacques-Cartier unorg. terr. The Jacques-Cartier River is a river in the province of Quebec, Canada. It is 161 km long and its source is Jacques-Cartier Lake in Laurentides Wildlife Reserve, and flows in a predominantly southern direction before ending in the Saint Lawrence River at Donnacona, about 30 km upstream from Quebec City. 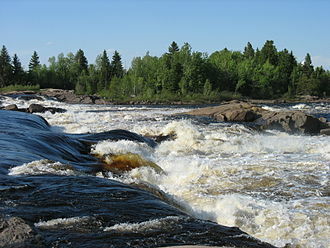 It is currently under nomination for Canadian Heritage River status. The Jacques-Cartier River drains an area of 2,515 square kilometres (971 sq mi), starting in and flowing for nearly 160 kilometres (99 mi) through the Laurentian mountains in the geological region of Grenville (one of the youngest sections of the Canadian Shield, formed 955 million years ago), then flows through the sedimentary rocks of the St. Lawrence Lowlands for approximately 17 kilometres (11 mi), from the municipality of Pont-Rouge to its mouth. The area covered by the drainage basin is for the most part undeveloped or protected, especially its source. In fact, 77% of its length is protected by the Laurentides Wildlife Reserve and the Jacques-Cartier National Park where one finds a steep glaciated valley formed during the last glaciation. Nevertheless, about 25,000 people live on the shores of this river close to its mouth, where it crosses the regional municipality of Portneuf and the municipalities of Tewkesbury, Saint-Gabriel-de-Valcartier, Shannon, Sainte-Catherine-de-la-Jacques-Cartier, Pont-Rouge and Donnacona. Downstream view in winter from de l'Épaule hill, Jacques-Cartier National Park. The reports that according to surveyor John Adams, in 1829, the river was known by the Hurons as Lahdaweoole, meaning "coming from far". They and the Montagnais used its shores for fishing and trapping. 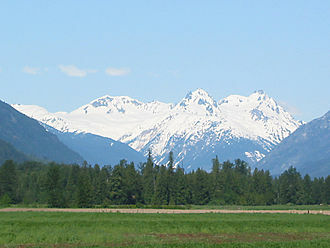 It is estimated that this region has been used by First Nations for over 7,000 years. Explorer Samuel de Champlain mentioned this river in 1632 as the "Sturgeon and Salmon River". In 1656, a map of Samson of Abbeville showed "R. J. Quartier" as the river's designation, probably so named according to the popular belief that Jacques Cartier had passed by the river's mouth. This natural highway was used among others by Jesuit missionaries to reach the Lac Saint-Jean area during the 17th century. Logging in the Laurentian highlands became an important economic activity during the second half of the 18th century. The Jacques-Cartier River was used for log drives to transport the logs to the Saint-Lawrence River and to the mills downstream. This practice was only stopped in 1975. With the settlement of French immigrants near the river's mouth came the formation of townships (modelled after English townships after their conquest of 1759) and new industries appeared such as flour mills. In 1895 the Laurentian Wildlife Reserve was created to provide fishing, hunting, and recreation opportunities for the people. From 1918 on, the construction of fishing camps made fishing more and more popular. The end of the First World War and the construction of nearby roads to Lac Saint-Jean also contributed to this popularity. Then hydro-electric dams started to be built, taking advantage of the river's geography up until the 1970s. In 1972, a proposed Hydro-Québec project would have flooded the Jacques-Cartier River valley, but the project was strongly opposed by the population. The government reversed its decision and in 1981 Jacques-Cartier Park was created out of the wildlife reserve as a 671 km2 (259 sq mi) conservation park, accessible to the public for nature interpretation and nature friendly recreation activities. The river bank is typically mixed forest, consisting of yellow birch and sugar maple, whereas the surrounding areas show rather the boreal forest rich in conifers, in particular the black spruce. This distinction is clearly visible in the steeper sections of the valley where a milder microclimate prevails. 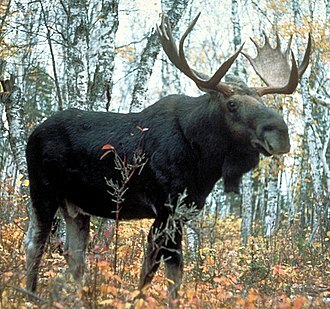 The fauna therefore is typical of a Canadian mixed forest. 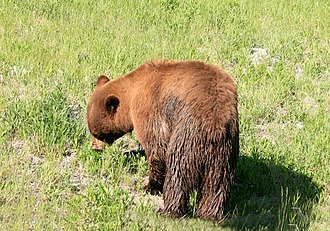 One can find in the Jacques-Cartier River valley the American black bear, bobcat, common raccoon, gray wolf, river otter, porcupine, moose, white-tailed deer, and caribou; in all 23 species of mammals. There are 104 species of birds, including birds of prey such as the barred owl, American kestrel, and osprey. Finally, there are 16 species of fish, of which brook trout in particular can be found frequently. 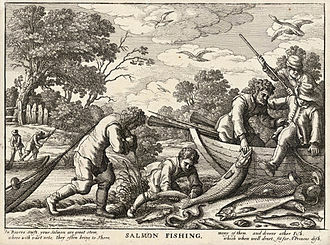 In addition, a reintroduction program has been established for Atlantic salmon, which disappeared from the river in the 19th century. Wikimedia Commons has media related to Rivière Jacques-Cartier. The osprey —also called fish eagle, sea hawk, river hawk, and fish hawk—is a diurnal, fish-eating bird of prey with a cosmopolitan range. It is a raptor, reaching more than 60 cm in length and 180 cm across the wings. It is brown on the upperparts and predominantly greyish on the head, the osprey tolerates a wide variety of habitats, nesting in any location near a body of water providing an adequate food supply. It is found on all continents except Antarctica, although in South America it occurs only as a non-breeding migrant, as its other common names suggest, the ospreys diet consists almost exclusively of fish. 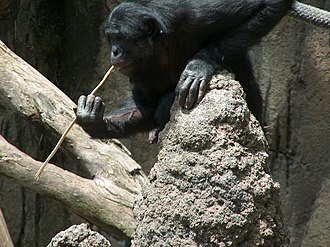 It possesses specialised physical characteristics and exhibits unique behaviour to assist in hunting and catching prey, as a result of these unique characteristics, it has been given its own taxonomic genus and family, Pandionidae. Four subspecies are recognized, one of which has recently been given full species status. Despite its propensity to nest near water, the osprey is not classed as a sea eagle, the osprey was one of the many species described by Carl Linnaeus in his 18th-century work, Systema Naturae, and named as Falco haliaeetus. The genus, Pandion, is the member of the family Pandionidae, and used to contain only one species. 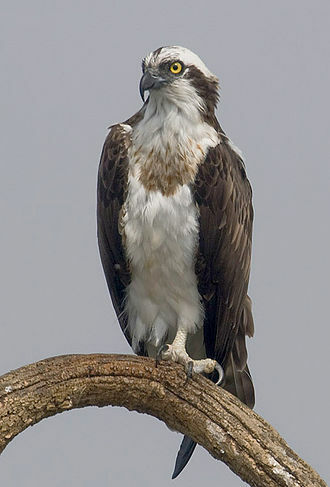 The genus Pandion was described by the French zoologist Marie Jules César Savigny in 1809, the osprey differs in several respects from other diurnal birds of prey. Its toes are of length, its tarsi are reticulate. The osprey and owls are the only raptors whose outer toe is reversible and this is particularly helpful when they grab slippery fish. The Sibley-Ahlquist taxonomy has placed it together with the diurnal raptors in a greatly enlarged Ciconiiformes. The osprey is unusual in that it is a living species that occurs nearly worldwide. Even the few subspecies are not unequivocally separable, there are four generally recognised subspecies, although differences are small, and ITIS lists only the first two. P. h. carolinensis –, North America and this form is larger, darker bodied and has a paler breast than nominate haliaetus. P. h. ridgwayi – Maynard,1887, Caribbean islands and this form has a very pale head and breast compared with nominate haliaetus, with only a weak eye mask. Composed of igneous rock resulting from its long volcanic history, the area is covered by a thin layer of soil. Human population is sparse, and industrial development is minimal, while mining is prevalent, the Canadian Shield is a physiographic division, consisting of five smaller, physiographic provinces, the Laurentian Upland, Kazan Region, Davis and James. The shield extends into the United States as the Adirondack Mountains, the Canadian Shield is U-shaped and is a subsection of the Laurentia craton signifying the area of greatest glacial impact creating the thin soils. The Canadian Shield is more than 3.96 billion years old, the Canadian Shield once had jagged peaks, higher than any of todays mountains, but millions of years of erosion have changed these mountains to rolling hills. The Canadian Shield was the first part of North America to be elevated above sea level and has remained almost wholly untouched by successive encroachments of the sea upon the continent. It is the Earths greatest area of exposed Archean rock, the metamorphic base rocks are mostly from the Precambrian Supereon, and have been repeatedly uplifted and eroded. 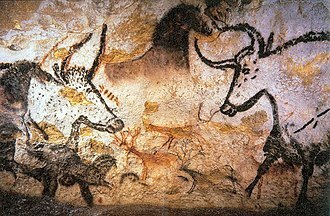 Today it consists largely of an area of low relief 300 to 610 m above sea level with a few monadnocks, during the Pleistocene Epoch, continental ice sheets depressed the land surface, scooped out thousands of lake basins, and carried away much of the regions soil. When the Greenland section is included, the Shield is approximately circular, bounded on the northeast by the northeast edge of Greenland and it covers much of Greenland, most of Quebec north of the St. In total, the area of the Shield covers approximately 8,000,000 km2. The underlying rock structure includes Hudson Bay, the Canadian Shield is among the oldest on earth, with regions dating from 2.5 to 4.2 billion years. The multitude of rivers and lakes in the region is caused by the watersheds of the area being so young. It has some of the oldest volcanoes on the planet and it has over 150 volcanic belts whose bedrock ranges from 600 to 1200 million years old. Each belt probably grew by the coalescence of accumulations erupted from numerous vents, many of Canadas major ore deposits are associated with Precambrian volcanoes. The North American porcupine, known as the Canadian porcupine or common porcupine, is a large rodent in the New World porcupine family. The beaver is the rodent in North America that is larger than the North American porcupine. The word porcupine comes from the middle or old French word porcespin and its roots derive from the Latin words porcus or pig and spina meaning thorns. Other colloquial names for the animal include quill pig and it is referred to as the Canadian porcupine or common porcupine. The porcupines scientific name, Erethizon dorsatum, can be translated as the animal with the irritating back. Several Native American names exist, such as the Lakota name pahin meaning quill, the North American porcupine migrated from South America, where all New World porcupines or hystricomorphs evolved. Erethizon appeared in North America shortly after the two joined together in the Tertiary period. Other hystricomorphs migrated, but Erethizon was the one to survive north of Mexico. No known fossils are attributed to prior to the late Tertiary period. Some fossils, such as species from the family Paramyidae, show resemblance to the porcupine, South American hystricomorphs first appeared in the Lower Oligocene period. They are thought to have migrated from Africa, ancestors of the Old World porcupines or Hystricidae or they originated based on a migration of the North American Paramyidae. The earliest appearance of E. dorsatum is from the Pleistocene era found along the Arroyo del Cedazo near Aguascalientes, seven subspecies of E. dorsatum are recognized. 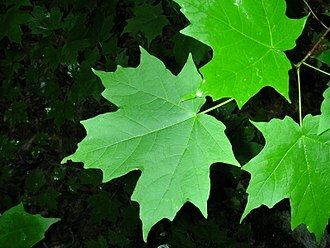 They are subdivided by different ranges across North America, by far the most common is E. d. dorsatum, which ranges from Nova Scotia to Alberta and from Virginia to the Yukon. E. d. picinum occupies a range in northeastern Quebec. E. d. couesi is the most southern ranging from northern Mexico to Colorado, E. d. bruneri can be found in the midwest from Arkansas to Montana. The last three are western species, from south to north they are E. d. epixanthum, E. d. nigrescens, and E. d. myops. Porcupines are usually brown or black in color, with white highlights. The Athabasca River originates from the Columbia Glacier of the Columbia Icefield in Jasper National Park in Alberta, Canada. The impressive and scenic Athabasca Falls is located upstream about 30 km from the Jasper townsite, the name Athabasca comes from the Woods Cree word aðapaskāw, which means there are plants one after another, likely a reference to the spotty vegetation along the river. 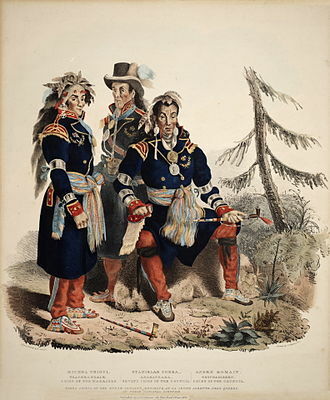 Sekani, Kootenay, Salish and Cree tribes hunted and fished along the river prior to the European colonization, david Thompson and Thomas the Iroquois travelled through Athabasca Pass in 1811. In 1862, the Athabasca Springs area was crossed during the Cariboo Goldrush by the Overlander Party. This river was designated a Canadian Heritage River for its importance to the fur trade, the river flows along icefields and through gorges, offering wildlife habitat on its shores and adjacent marshes. Its course is marked by rapids, impeding navigation southwest of Fort McMurray, the Athabasca River travels 1,231 km before draining into the Peace-Athabasca Delta near Lake Athabasca south of Fort Chipewyan. The cumulative drainage area is 95,300 km2, numerous communities are located on the banks of the Athabasca River, including Jasper, Entrance, Whitecourt, Fort Assiniboine, Athabasca, Fort McMurray, and Fort MacKay. An independent study has concluded that the Athabasca River contains elevated levels of pollution downstream of the Athabasca oil sands, testing has shown this portion of the river contains mercury, lead and 11 other toxic elements. On October 31,2013, one of Obed Mountain coal mines pits failed, the plume of waste products joined the Athabasca River, travelling downstream for a month before settling in Lake Athabasca near Fort Chipewyan, over 500 km away. Owing to its proximity to the Athabasca Oil Sands, the river has significant amounts of energy infrastructure constructed along its course. On June 6,1970, a pipeline operated by Great Canadian Oil Sands, the precursor to Suncor, the total spill volume was estimated by Great Canadian Oil Sands at approximately 1,190 barrels of oil. Quebec City, Ville de Québec, officially Québec) is the capital city of the Canadian province of Quebec. Founded in 1608 by Samuel de Champlain, Quebec City is one of the oldest cities in North America. The citys landmarks include the Château Frontenac, a hotel which dominates the skyline, and La Citadelle, the National Assembly of Quebec, the Musée national des beaux-arts du Québec, and the Musée de la civilisation are found within or near Vieux-Québec. Thus, Québec is officially spelled with an accented é in both Canadian English and French, although the accent is not used in common English usage. Quebec City is one of the oldest European settlements in North America, while many of the major cities in Latin America date from the sixteenth century, among cities in Canada and the U. S. few were created earlier than Quebec City. Also, Quebecs Old Town is the only North American fortified city north of Mexico whose walls still exist, French explorer Jacques Cartier built a fort at the site in 1535, where he stayed for the winter before going back to France in spring 1536. 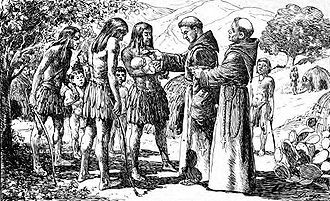 He came back in 1541 with the goal of building a permanent settlement, Quebec was founded by Samuel de Champlain, a French explorer and diplomat on 3 July 1608, and at the site of a long abandoned St. Lawrence Iroquoian settlement called Stadacona. Champlain, called The Father of New France, served as its administrator for the rest of his life, the name Canada refers to this settlement. 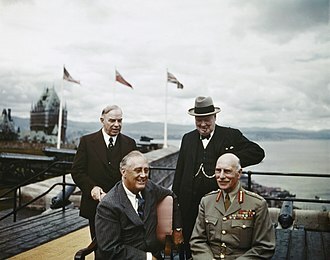 Although called the cradle of the Francophone population in North America, the place seemed favourable to the establishment of a permanent colony. 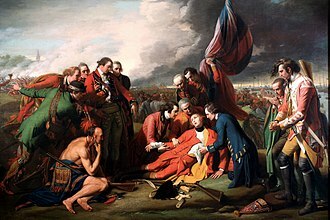 In 1629 there was the surrender of Quebec, without battle, Samuel de Champlain argued that the English seizing of the lands was illegal as the war had already ended, he worked to have the lands returned to France. 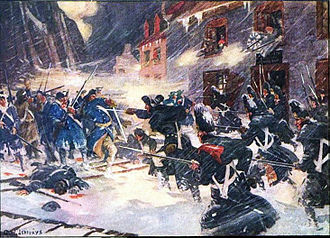 As part of the negotiations of their exit from the Anglo-French War. These terms were signed into law with the Treaty of Saint-Germain-en-Laye, the lands in Quebec and Acadia were returned to the French Company of One Hundred Associates. In 1665, there were 550 people in 70 houses living in the city, one-quarter of the people were members of religious orders, secular priests, Ursulines nuns and the order running the local hospital, Hotel-Dieu. This includes both sedentary and migratory populations. While overall widespread and numerous, some of its subspecies are rare, for this reason, it is considered to be vulnerable by the IUCN. Reindeer vary considerably in colour and size, both sexes can grow antlers annually, although the proportion of females that grow antlers varies greatly between population and season. 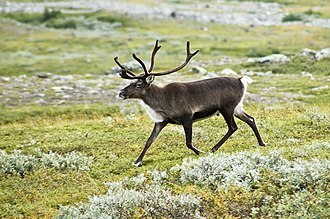 Antlers are typically larger on males, hunting of wild reindeer and herding of semi-domesticated reindeer are important to several Arctic and Subarctic peoples. In traditional festive legend, Santa Clauss reindeer pull a sleigh through the sky to help Santa Claus deliver gifts to children on Christmas Eve. The name Rangifer, which Carl Linnaeus chose for the genus, was used by Albertus Magnus in his De animalibus. This word may go back to a Saami word raingo, for the origin of the word tarandus, which Linnaeus chose as the specific epithet, he made reference to Ulisse Aldrovandis Quadrupedum omnium bisulcorum historia fol. However, Aldrovandi – and before him Konrad Gesner – thought that rangifer, in any case, the tarandos name goes back to Aristotle and Theophrastus – see In history below. 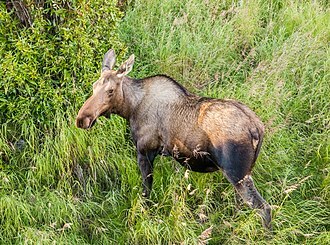 Because of its importance to many cultures, Rangifer tarandus and some of its subspecies have names in many languages, the name rein is of Norse origin. The Finnish name poro may stem from the same, the word deer was originally broader in meaning, but became more specific over time. In Middle English, der meant a wild animal of any kind. Cognates of Old English dēor in other dead Germanic languages have the sense of animal, such as Old High German tior, Old Norse djúr or dýr, Gothic dius, Old Saxon dier. 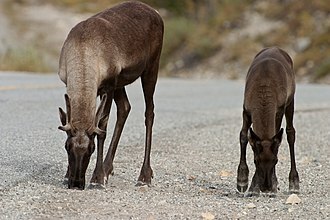 The name caribou comes, through French, from Mikmaq qalipu, meaning snow shoveler, in Inuktitut, spoken in eastern Arctic North America, the caribou is known by the name tuktu. In the western North American Arctic, the used by the Iñupiat is tuttu. 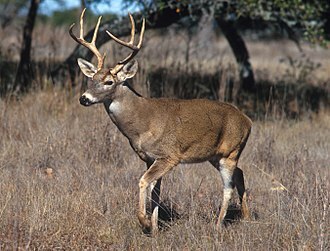 Across the range of a species, individuals may display considerable morphological, genetic, COSEWIC developed Designated Unit attribution to add to classifications already in use. Mammals are any vertebrates within the class Mammalia, a clade of endothermic amniotes distinguished from reptiles by the possession of a neocortex, three middle ear bones and mammary glands. All female mammals nurse their young with milk, secreted from the mammary glands, Mammals include the largest animals on the planet, the great whales. 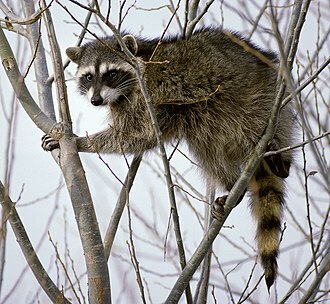 The basic body type is a quadruped, but some mammals are adapted for life at sea, in the air, in trees. 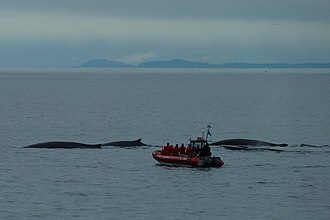 The largest group of mammals, the placentals, have a placenta, Mammals range in size from the 30–40 mm bumblebee bat to the 30-meter blue whale. 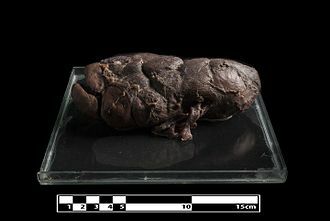 With the exception of the five species of monotreme, all modern mammals give birth to live young, most mammals, including the six most species-rich orders, belong to the placental group. 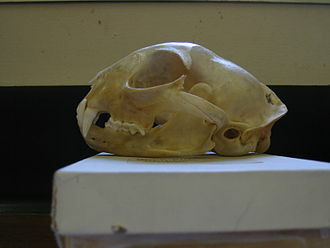 The largest orders are the rodents and Soricomorpha, the next three biggest orders, depending on the biological classification scheme used, are the Primates, the Cetartiodactyla, and the Carnivora. Living mammals are divided into the Yinotheria and Theriiformes There are around 5450 species of mammal, in some classifications, extant mammals are divided into two subclasses, the Prototheria, that is, the order Monotremata, and the Theria, or the infraclasses Metatheria and Eutheria. 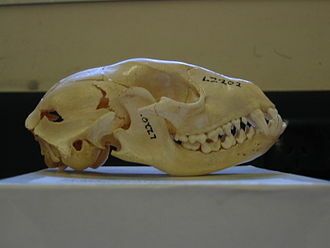 The marsupials constitute the group of the Metatheria, and include all living metatherians as well as many extinct ones. Much of the changes reflect the advances of cladistic analysis and molecular genetics, findings from molecular genetics, for example, have prompted adopting new groups, such as the Afrotheria, and abandoning traditional groups, such as the Insectivora. The mammals represent the only living Synapsida, which together with the Sauropsida form the Amniota clade, the early synapsid mammalian ancestors were sphenacodont pelycosaurs, a group that produced the non-mammalian Dimetrodon. At the end of the Carboniferous period, this group diverged from the line that led to todays reptiles. 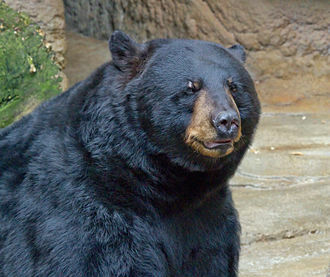 Some mammals are intelligent, with some possessing large brains, self-awareness, Mammals can communicate and vocalize in several different ways, including the production of ultrasound, scent-marking, alarm signals and echolocation. Mammals can organize themselves into fission-fusion societies and hierarchies, most mammals are polygynous, but some can be monogamous or polyandrous. The North American river otter, known as the northern river otter or the common otter, is a semiaquatic mammal endemic to the North American continent found in and along its waterways and coasts. An adult river otter can weigh between 5.0 and 14 kg, the river otter is protected and insulated by a thick, water-repellent coat of fur. The river otter, a member of the subfamily Lutrinae in the family, is equally versatile in the water. It establishes a close to the waters edge in river, swamp, coastal shoreline, tidal flat. The den typically has many openings, one of which generally allows the otter to enter. Female otters give birth in these burrows, producing litters of one to six young. North American river otters, like most predators, prey upon the most readily accessible species, fish is a favored food among the otters, but they consume various amphibians, freshwater clams, snails, small turtles and crayfish. Instances of river otters eating small mammals and occasionally birds have been reported as well, the range of the North American river otter has been significantly reduced by habitat loss, beginning with the European colonization of North America. In some regions, their population is controlled to allow the trapping and harvesting of otters for their pelts, River otters are very susceptible to the effects of environmental pollution, which is a likely factor in the continued decline of their numbers. A number of projects have been initiated to help stabilize the reduction in the overall population. The North American river otter was first described by German naturalist Johann Christian Daniel von Schreber in 1777. The mammal was identified as a species of otter and has a variety of names, including North American river otter, northern river otter, common otter and, simply. Other documented common names are American otter, Canada otter, Canadian otter, fish otter, land otter, nearctic river otter, the river otter was first classified in the genus Lutra, Lutra was the early European name. The species name was Lutra canadensis, the species epithet canadensis means of Canada. In a new classification, the species is called Lontra canadensis, molecular biological techniques have been used to determine when the river otter and the giant otter of South America diverged. Taiga known as boreal forest or snow forest, is a biome characterized by coniferous forests consisting mostly of pines and larches. 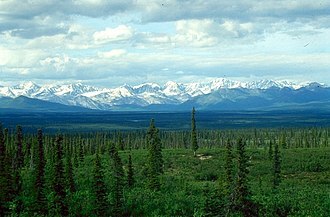 The taiga is the worlds largest biome apart from the oceans, in North America it covers most of inland Canada and Alaska as well as parts of the extreme northern continental United States, where it is known as the Northwoods or North woods. 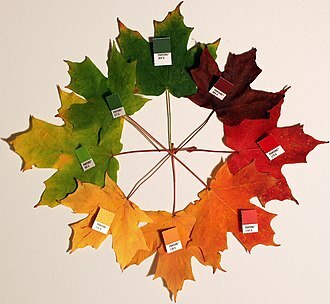 However, the tree species, the length of the growing season. Hoffman discusses the origin of this use in North America. Although at high elevations taiga grades into alpine tundra through Krummholz, it is not an alpine biome only like subalpine forest, Taiga is the worlds largest land biome, and makes up 29% of the worlds forest cover, the largest areas are located in Russia and Canada. The taiga is the terrestrial biome with the lowest annual average temperatures after the tundra, extreme winter minimums in the northern taiga are typically lower than those of the tundra. The lowest reliably recorded temperatures in the Northern Hemisphere were recorded in the taiga of northeastern Russia, the taiga or boreal forest has a subarctic climate with very large temperature range between seasons, but the long and cold winter is the dominant feature. This climate is classified as Dfc, Dsc and Dwd in the Köppen climate classification scheme, meaning that the summer lasts 1–3 months. In Siberian taiga the average temperature of the coldest month is between −6 °C and −50 °C, the mean annual temperature generally varies from -5 °C to 5 °C, but there are taiga areas in eastern Siberia and interior Alaska-Yukon where the mean annual reaches down to -10 °C. According to some sources, the boreal forest grades into a mixed forest when mean annual temperature reaches about 3 °C. The winters, with temperatures below freezing, last five to seven months. Temperatures vary from −54 °C to 30 °C throughout the whole year, the summers, while short, are generally warm and humid. In much of the taiga, -20 °C would be a winter day temperature and 18 °C an average summer day. In Canada and Finland, the season is often estimated by using the period of the year when the 24-hour average temperature is +5 °C or more. 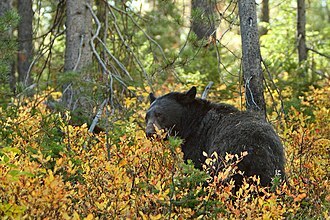 For the Taiga Plains in Canada, growing season varies from 80 to 150 days, some sources claim 130 days growing season as typical for the taiga. Typical Canadian Shield: spruce, lakes, bogs, and rock. Typical shield landscape in a southern Ontario region with very few old growth trees, due to a history of logging and fires. Black River, Queen Elizabeth II Wildlands Provincial Park. A glaciated valley in the Altai Mountains showing the characteristic U shape. U-shaped valley in Leh valley, Ladakh, NW Indian Himalaya. The glacier visible at the head of the valley is the last remnants of the formerly much more extensive valley glacier which carved this valley. 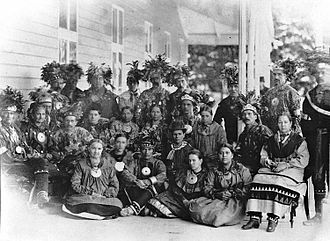 Three Huron-Wyandot chiefs from the Huron reservation (Lourette) now called Wendake in Quebec, Canada. 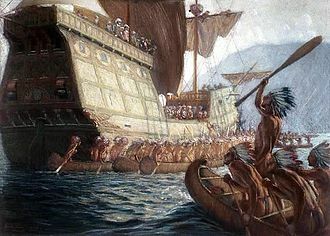 After their defeat by the Iroquois, many Huron fled to Quebec for refuge with their French allies, where a reserve was set aside for their use. Others migrated across Lake Huron and the St. Clair River, settling in the northern Ohio and Michigan region. 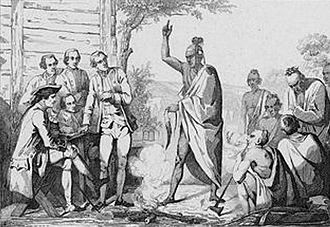 Conference between the French and First Nations leaders by Émile Louis Vernier. 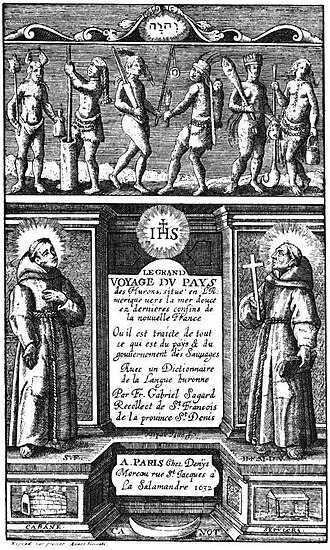 Detail from "Deffaite des Yroquois au Lac de Champlain," ChamplainVoyages (1613). This self-portrait is the only surviving contemporary likeness of the explorer. Inauthentic depiction of Champlain, by Théophile Hamel (1870), after the one by Ducornet (d. 1856), based on a portrait of Michel Particelli d'Emery (d. 1650) by Balthasar Moncornet (d. 1668). — No authentic portrait of Champlain is known to exist. The Church of the Gesù, located in Rome, is the mother church of the Jesuits. The Washington Iron Works Skidder in Nuniong is the only one of its kind in Australia, with donkey engine, spars, and cables still rigged for work. Montreal Light, Heat and Power linemen. The North American ice storm of January 1998 left 1.4 million Hydro-Québec customers in the dark for up to five weeks. The Hydro-Québec Building is a landmark of Montreal's downtown. The taiga in the river valley near Verkhoyansk, Russia, at 67°N, experiences the coldest winter temperatures in the northern hemisphere, but the extreme continentality of the climate gives an average daily high of 22 °C (72 °F) in July. 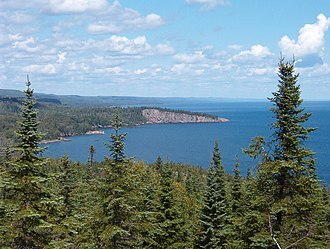 Boreal forest near Shovel Point in Tettegouche State Park, along the northern shore of Lake Superior in Minnesota. 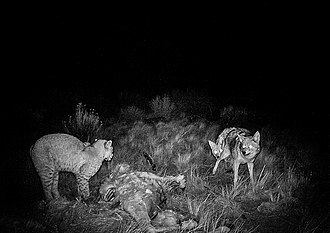 Bobcat confronting a pair of coyotes. 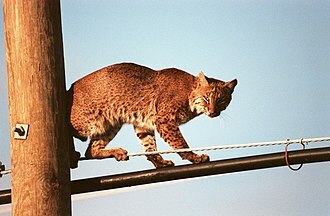 Bobcat in urban surroundings: The species' range does not seem to be limited by human populations, as long as it can still find a suitable habitat. A Torch Key raccoon (P. l. incautus) in Cudjoe Key, Florida. Subspecies inhabiting the Florida Keys are characterized by their small size and very pale fur. The North American river otter's streamlined shape allows it to glide through the water. The species inhabits coastal areas, such as marshland. North American river otters are hunted and trapped for their valuable fur. Porcupines prior to mating. The female is higher in the tree. 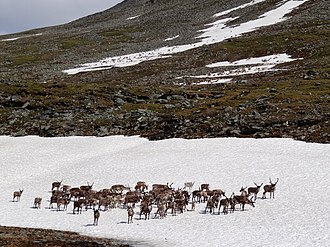 Reindeer standing on snow to avoid bloodsucking insects. Kestrel resting in an apple tree. 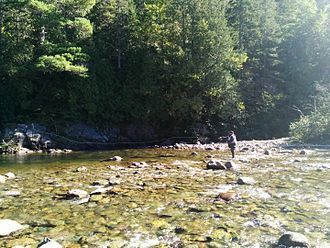 An Atlantic Salmon Recreational Fishermen in the Pabos River of Quebec. 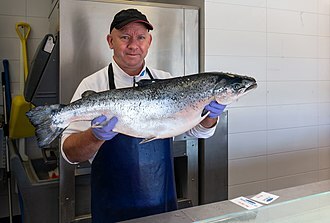 A fishmonger in Lysekil, Sweden shows a Norwegian salmon. 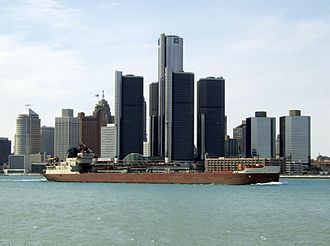 A Canadian police boat from Windsor, passing by the Renaissance Center in 2007. As one of the most important waterways in the world, large freighters are a common sight on the Detroit River. Much of the lower portion of the river (Mud Island pictured) is now part of the Detroit River International Wildlife Refuge. The Renaissance Center, located in downtown Detroit, is one of the most recognizable features along the shores of the Detroit River. Black spruce taiga, Copper River, Alaska. Ultra-thin sugar maple sections from Romeyn Beck Hough's American Woods. From top to bottom, the image displays transverse, radial and tangential sections. The adjacent image shows light passing through the specimens.